Since getting my new DSLR camera for Christmas, I’ve been on a mission. I’ve been teaching myself how to use my camera and take photographs. I’ve read a few books, but never finished them because they left me even more confused than when I started. I even downloaded the free trial of Photoshop on my computer and took a live online class on Beginner’s Photoshop. I was so lost though and felt very frustrated. It moved too quickly and I just felt like I was missing something. It’s not a nice feeling to feel like you don’t understand something. I was chatting about my experience with an online acquaintance and told her how much I wanted to learn Photoshop, but was having difficulty finding a book or course that would explain it slowly and in simple terms. Right away, she said she was also was learning Photoshop at lynda.com and loved it. She said it was videos that she could watch at her own pace and was comfortable with what she was learning. Of course, I googled right away to check it out and bookmarked the site and wanted to come back to it once I purchased Photoshop. It had SO many courses that would help me! I knew I wanted to try it. The funny thing was not even a couple weeks later, I received an offer to review lynda.com! Talk about great timing! I was beyond excited and started browsing and selecting future courses to take. Now I can learn Photoshop and so much more. I consider myself a lifelong learner so lynda.com is perfect for me. Just in case you haven’t heard of lynda.com, let me explain a little about what its all about. lynda.com is an online subscription library with over 1400 online courses to help you learn software, creative and business skills. The courses feature high-quality instructional video taught by recognized industry experts in areas like 3D + Animation, Business, Design, Photography, web/mobile/app development more. 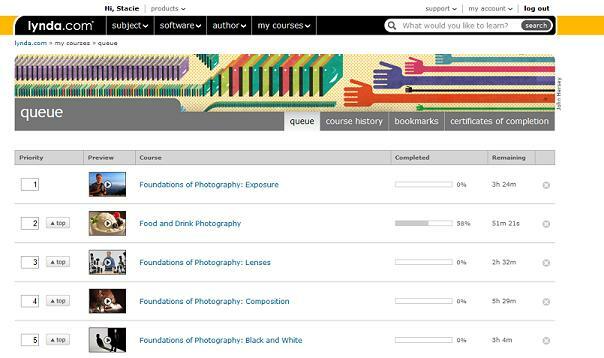 I was most interested in the photography courses so that’s the category I explored first. The ones I liked I clicked the little + symbol beside the course name to “add to queue”, which bookmarks my selections so I can easily find them. Foundations of Photography: Exposure: Understand how shutter speed, aperture, and ISO settings relate to one another, and how these settings expand your artistic options with any photograph. Food and Drink Photography: Demonstrates the art and science behind shooting food and drink photographs. Foundations of Photography: Lenses: Shows how to understand, choose, and properly use lenses. Foundations of Photography: Composition: A detailed exploration of the concepts of composition, from basics such as the rule of thirds and leading lines to more advanced topics such as entry and exit points. Foundations of Photography: Black and White: Ben Long shares strategies for capturing the best black and white images and techniques for converting to black and white in Photoshop. I started the Food and Drink Photography first since I have a few recipe posts coming up and wanted to learn some tips and tricks to improve them. 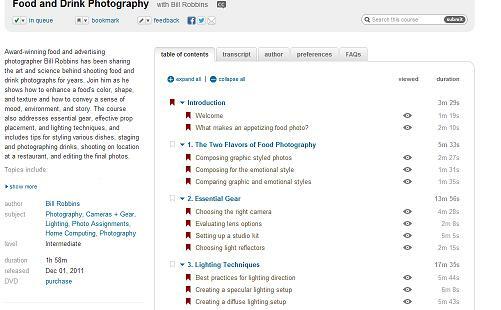 The course page is broken down into sections in the Table of Contents. I can see the different lessons and how long each one is. Once I’m done, I click on the ribbon to highlight it so I never forget where I left off. The other tabs are Transcript (to read instead of watch), Author (info about the instructor), Preferences (technical specifications of how you want to watch the videos/closed captioning toggle) and FAQ. I spend 99.99% of my time on the Table of Contents where all the videos are located. I click on the lesson I want to watch and a video opens up. They aren’t very long which is great so you can watch one if time is limited or a bunch at a once if time is on your side. I tend to do one chapter at a time then leave it sink in and come back the next day. The Food and Drink Photography was amazing! I loved being able to rewind and watch the video again if there was something I missed or needed explained again. The instructor was easy to understand and went at pace I was comfortable keeping up with. I found his visual examples extremely helpful since I need to see it done to fully understand. He would set up shots and then photograph and show us how the picture turned out. In the lighting section, he showed us the various types of lighting and types of reflectors and how they can really change the look of your photograph. One of the chapters was about Food Styling and he brought in a professional food stylist. Although I probably will never hire a food stylist for my blog, it was neat to see how it’s done. For instance, cereal on a spoon was actual cereal but sprayed with a chemical so it would retain its shape. The milk on the spoon was not even milk at all!! Even John stopped what he was doing and watched that one with me. 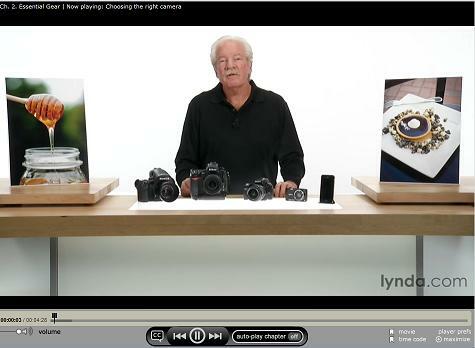 You can purchase a monthly membership to lynda.com for $25/month or $37.50/month for the premium plan. Save even more money by buying an annual membership at $250/year or $375/year for the premium membership. I’m just about finished the Food & Drink Photography course and then will be moving onto one of my other selections. I will update you all in a couple weeks with another post about my progress! I would love to take the Iphone Photography from shooting to storytelling class! Thanks for sharing your thoughts about Lynda.com! I would love the photography and photo editing!!!! I would take the WordPress 3 designing and creating themes one first. I’d like to take Shooting with the Canon Rebel T3i. Photoshop CS6 Essential Training is the course I want. I really love lynda’s tutorial. I hope I can get a subscription for me. Any of the photography ones. So many I’d like to take, but I would start with InDesign Secrets. I would love to take 3 D Rendering. 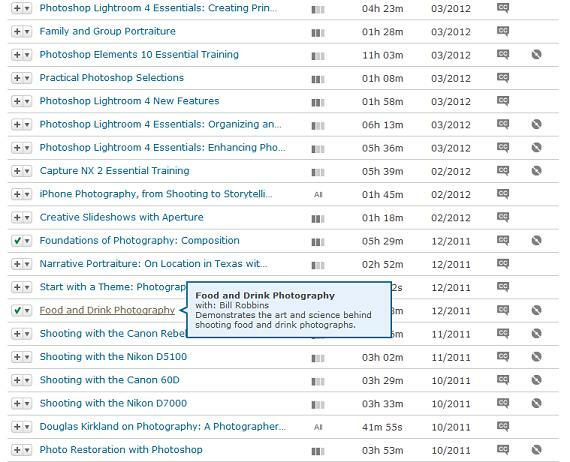 The Food and Drink Photography course looks very interesting!